Catholic leaders in Minnesota warmly received word of the election of the new pope. The Holy Father is the leader of the largest religious denomination in the state. Pope Benedict XVI visited Minnesota in the mid-'80s. Church leaders here describe him as a witty, intelligent and religiously devoted man. St. Paul, Minn. — The sounds of Hennepin Ave. traffic mixed with the celebratory bells at the Basilica of St. Mary in Minneapolis. A little over an hour after the white smoke poured from the Vatican chimney, Father Michael O'Connell announced the conclave's decision at his noon mass. O'Connell called on Catholics to find common ground with the higher power that navigates such important decisions. "At this point in the process, what is really important is for all of us Catholics to dig really deep, and realize that in our belief the Holy Spirit guides the church in all aspects, and especially in its leadership," O'Connell said. As a cardinal, Joseph Ratzinger was a noted conservative voice on church issues and served closely with his predecessor John Paul II, a staunch traditional idealogue. But O'Connell warns there's no way to predict the future contributions of Pope Benedict XVI. O'Connell points to speculation about Pope John XXIII in 1958, and Pope John Paul II in 1978, after each was chosen. Pope John surprised the world with the liturgical reforms of the Second Vatican Council. John Paul held the line on church dogma, while his personal charm bridged the Catholic faith to other religions. "People at the time had their minds made up. They knew exactly how the church was going to go," said O'Connell. "Well, it didn't necessarily go the way they thought it was going to go. So I think this is a great time to pray for our new pope, Benedict XVI, and pray for the church. It's a terribly important time in the life of the church." Despite Minnesota's reputation for its Lutheran heritage, there are more Catholics in the state than any other faith. A 2000 survey of congregations by the Glenmary Research Center estimates the number of Minnesota Catholics at a little over 1.2 million. One of those, Teresa Walker, put any initial doubts she might have about the new pope aside. Pope Benedict XVI is a very cordial man who will continue the line of Pope John Paul II but put his own imprint on the church. "I feel like this action was guided by the Holy Spirit, and I accept it as that," said Walker. After the noon mass at the Basilica, Walker said she's not surprised Cardinal Ratzinger was chosen. "No I wasn't, because he worked so closely with Pope John Paul II, and to me he's really qualified for the job," said Walker. "The people who know a lot more about it than I do felt like he would be the one to lead the church." The new pope has a connection to Minnesota. 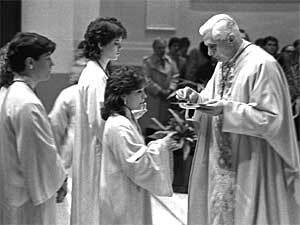 In 1984, then- Cardinal Ratzinger came to the Twin Cities to give an address and receive an honorary degree at the University of St. Thomas. Ratzinger helped commemorate the 15th anniversary of the St. John Vianney Seminary, the college-level seminary at St. Thomas. Archbishop Harry Flynn issued a statement saying he spoke with Ratzinger recently, and Ratzinger recalled his visit to Minnesota warmly. Kevin McDonough, the vicar general for the St. Paul-Minneapolis Archdiocese, considers the new pope intelligent, quick-witted and very open. "I've just spoken to (Archbishop Flynn) in the last few minutes. And he told me about a visit he had with the cardinal just three months ago, in which he found him very collegial, instructive and very cordial," said McDonough. "Cardinal Ratzinger, now Pope Benedict XVI, is a very cordial man who will continue the line of Pope John Paul II but put his own imprint on the church." McDonough says Ratzinger was directly involved in helping the church resolve the recent spate of priest sexual abuse scandals. McDonough says the new pope will be a "very responsible leader in that regard." McDonough says he doesn't feel Benedict XVI brings with him plans for sweeping changes. But he says with his intellect, the new pope is not likely to be merely a place-holder for the status quo, either.